Started out dreading today--that Devil's Slide trail is a lot of up. And will there be any snow? Yep. I fully intended to get up early and get out. I didn't, despite crashing at 9pm and flopping myself on the nice soft bed. I didn't sleep well, and woke up around 2am for an hour before falling back asleep. This 'wake up for an hour in the middle of the night' is getting to be a pattern. So I lazed in the luxury of an actual bed until 6:30... then taped my feet up for another hour. 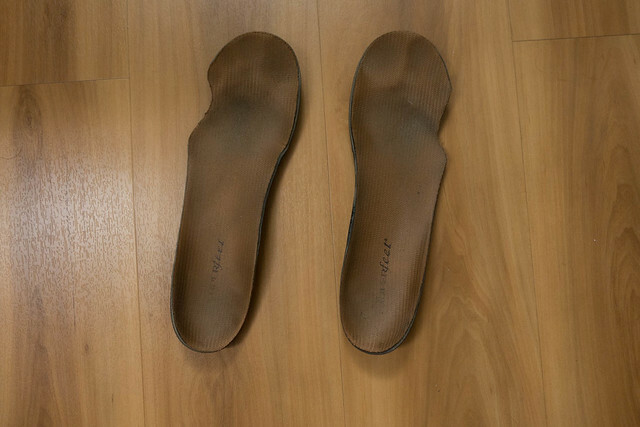 I had the bright idea that I should cut pinkie notches out of my insoles, which gave them a lot more space and really lessened the blister pain, which it did. 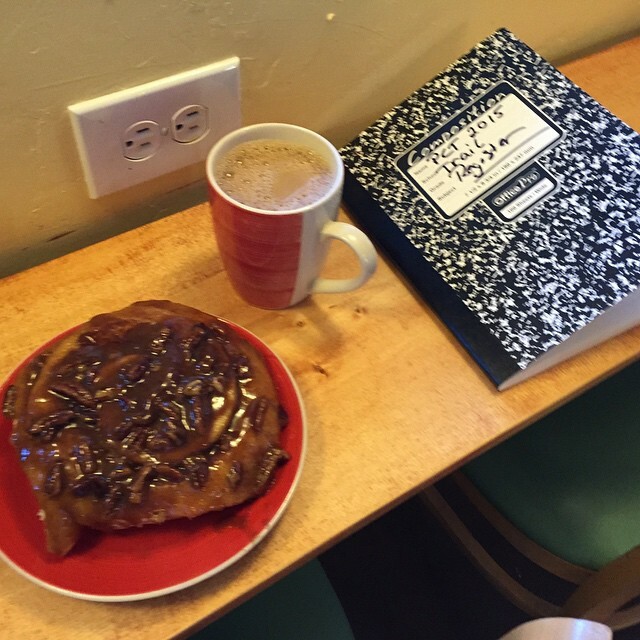 After that I gathered up all my gear and did the long 2 minute walk to the Town Baker, where I ordered the most fantastic sticky bun and gulped three cups of coffee while I procrastinated on heading up that nasty Devil's slide trail, 2 1/2 miles long and 1600 feet elevation gain. 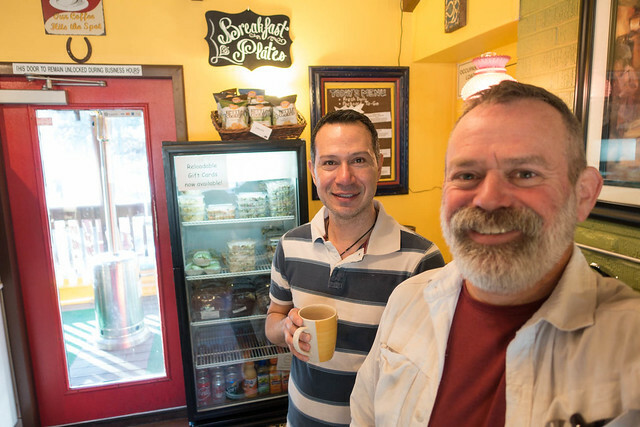 The bakery was a great cozy spot; Paul and Ken were busy baking stuff, I chatted with some of the regular customers who were fascinated by the solar panel on my pack, and I gave the guys a PCT register book I picked up at the pharmacy the day before and signed the first entry. I finally got going and went out to the road; I tried hitching but gave up after a few dozen cars and 10 minutes of "I'm not seeing you behind my cataract sunglasses" from passing drivers, then decided I'd just walk to the trailhead... at which point a woman pulled over and asked "Want a ride? I've just dropped the kids off at school and I'd be happy to help!" and I hopped in. I was the first PCTer she'd seen this season, and she apologized for the warm weather--it was going to be 80 or more in Idyllwild today. Hopefully it won't be windy on the mountain. Then Devil's Slide. Ugh. And... it was great. After my warmup mile, I just scooted along, up and up, passing a few day hikers headed to the top of San Jacinto. A pair of Forest Service workers asked to see my permit, and I dug it out, she commented "wow, that looks different this year, you're the first PCTer I've come across, this seems like a great year to go early." Yep, I think so too. Anyways, it took me an hour and forty minutes to get to the top of Devils Slide, a five way intersection called Saddle Junction at 8200 feet... and I wasn't winded or even feeling any altitude sickness; I guess the trail is making me pretty fit. 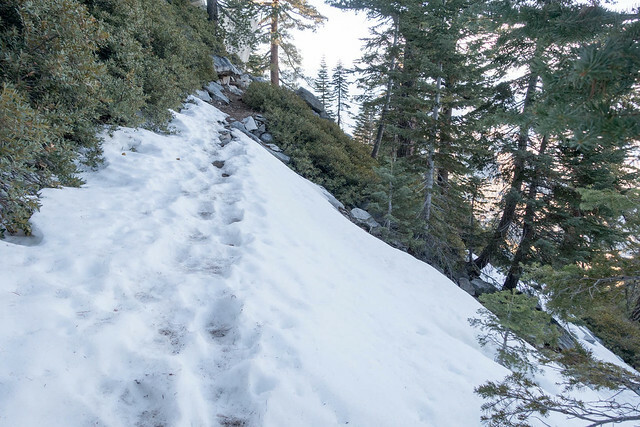 I started seeing a few snow patches--another worry for this section of the PCT this early--but they weren't really anything, and with maybe six inches to a foot on the ground it was easy to follow the track. The day hikers caught up with me as I was snapping pictures, and we chatted along for awhile. They're out of San Diego and just breaking themselves in for the season, and branched off around mile 182 while I headed west to Fuller Ridge. That section of the trail was spectacular, and the dry Santa Ana winds had cleared all the clouds and fog, I could see for a good hundred miles and was able to pick out one of the Channel Islands far to the west, in the direction of Temecula, yet not quite as far north as Saddleback Mountain. Perhaps San Clemente? Or maybe Catalina? 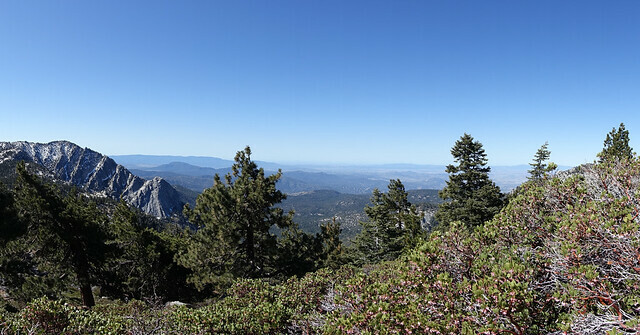 I wondered how many places you can actually see the Pacific Ocean from the Pacific Crest Trail--probably here and up on the Angeles Crest as well, above Los Angeles. I was feeling good, making good time, thinking this is a five star day. The mountain blocked any wind, it was calm and cool-but-sunny and fantastic hiking weather through the fir and pine forest. The trail condition, however, deteriorated from mile 183 or so on; it hadn't received any maintenance or much use since last year. Pinecones were a pesky nusiance, scattered along the trail and occasionally tripping me up, and here and there trees had fallen down durning the winter across the trail. Once I got in the state park land, there was a lot of signage but none of it had PCT directions on it, so I got out my GPS a few times to follow the track because I didn't trust the Magic Marker directions someone had addeded to the official signs (it actually ended up being correct). Around mile 186 is when things got... interesting. 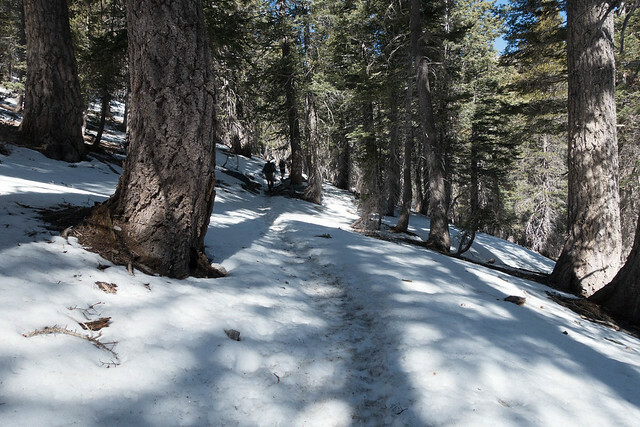 The elevation had increased to 8500 feet, and the snow banks on the north facing slopes was deeper and covering the trail and slopes. There were footholes that I used as I went down one particularly deep secton to the north fork of the San Jacinto River (really a creek here), and I postholed a few times up to my knee. Nothing bad, but one of the times my ankle got wedged between two rocks and it took some wiggling to get it out. From then on out I tried each foot hole first. 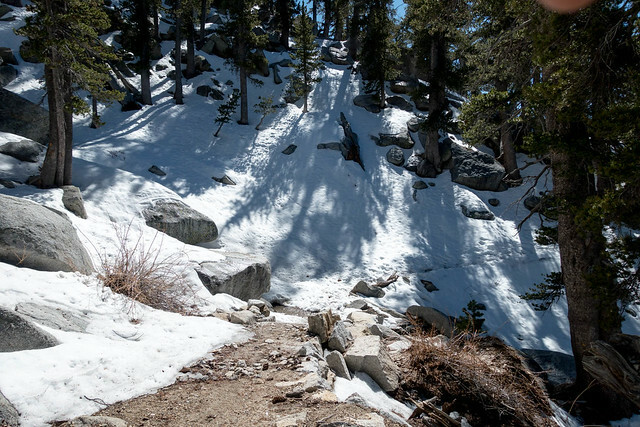 I was really glad I brought my trekking poles, and wish I had powder baskets, even for this slushy snow. That snow was off and on until mile 187, and I was happy to be done with it. Maybe I can make it to the campsite at mile 193 or 194 even today--it's only 4pm! The trail did a crazy up-and-down-and back and forth switchback across the south side of Fuller Ridge. Sure, I can do it! 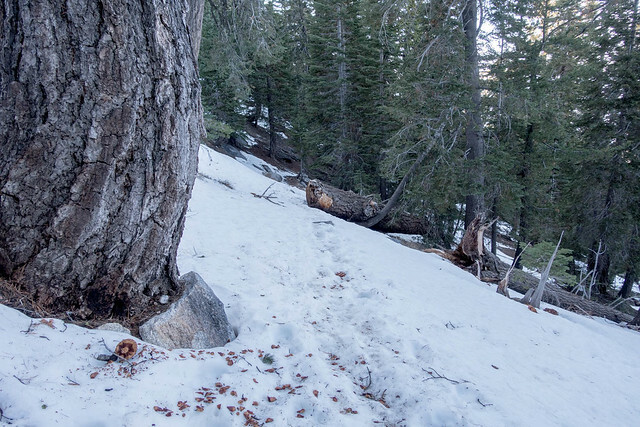 At mile 188, the trail plopped over the ridge and stayed on the north side of the ridge. In the snow. With lots of downhill, and the occasional uphill that I know would lead to more downhill. I followed the footholes, but many didn't hold. It's hard to walk downhill in the snow; I slipped a few times but didn't fall, though once I sat down unexpectedly quickly :-) It was a trudge, I was maybe making a mile an hour, and there were few breaks in the snow. I wondered where I'd spend the night; the slope was 30 to 45 degrees and there weren't any flat spaces at all. I was tired after hiking most of the day, and on top of that my pack was heavy with 4 liters of water; from mile 186 to 206 there isn't reliable water. Just as I was falling off to sleep I turned over and felt a large puddle of water under my sleeping pad. What??!? That's a wake-up call, and I spent five minutes tracing it to a tiny leak in an old Platypus bag. First time that's ever happened to me, but crap--will I have enough water to make it through the hot weather down below? I parceled out my water into my big big SmartWater bottle and another 2 liter Platypus, it came to about 3.7 liters or so... just enough for 14 miles walk. It was something that kept me up during the night off and on, and I wasn't real happy but thought things would be fine in the end.